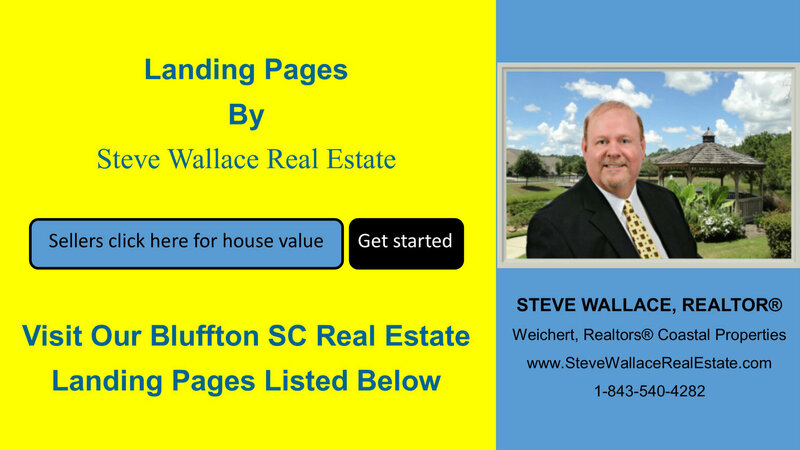 The Bluffton, South Carolina real estate and homes landing page, at Steve Wallace Real Estate, is unlike other landing pages. Traditional landing pages were a website's home page; but, today's landing pages are structured differently and strive to capture your contact information upon your first visit to a webpage. We offer a no pressure, stress-free, enjoyable online experience so you can get to know us, search the most comprehensive active listings database of Bluffton SC homes for sale, enjoy some local real estate music, and gain a wealth of free Bluffton SC real estate and homes information, at your leisure, before you make contact. At Steve Wallace Real Estate, we’re confident you’ll contact us when you’re ready to buy or sell a home in Bluffton and the surrounding areas. Why? Because we provide the best real estate service to folks buying homes and others selling homes. We convert online visitors to customers and clients by our focus on personal service and the wealth of information we provide on our website, Bluffton SC real estate e-books by author Steve Wallace, referrals from past clients, and the engaging content on our social media pages. We’re a one-stop shop for relocating home buyers and sellers. Click on the Testimonials link to learn what customers say about their experience in buying and selling homes with Steve Wallace Real Estate. We’re your trusted, local source for Realty service in all Greater Bluffton neighborhoods and plantations. Many real estate buyers and sellers arrive at a landing page in response to clicking on a search engine optimized search result or an online advertisement. In digital real estate marketing, a landing page is a standalone web page, created specifically for the purposes of a marketing or advertising campaign. The page goal is to get your contact information before you even have a chance to actually speak with a “live,” local real estate agent. This is a non-personal approach to lead generation. We believe you should know who you are contacting before providing your name and email address. Peruse Steve Wallace Real Estate online, access on our drop-down menus at the top of the web page, click on our social media links, search homes for sale… and you’ll learn your licensed resident, Bluffton South Carolina real estate agent, Steve Wallace, Realtor, provides a wealth of free information and brings over a decade of practical experience assisting relocating home buyers, real estate investors and sellers. Steve looks forward to assisting you too, whenever you are ready. Why not get in touch today for a free, no-obligation consultation and get moving? Steve looks forward to hearing from you. Relocating home buyers, real estate investors, and sellers can contact Steve in a variety of ways. Access our chat box at the bottom of our home page and you can chat “live” with him when he is online or simply leave him a message. Complete a contact form at Steve Wallace Real Estate, online. Send an email to SteveSellsHomes@Outlook.com. Send a text message or make a call to 843-540-4282 and speak with Steve Wallace on the phone. 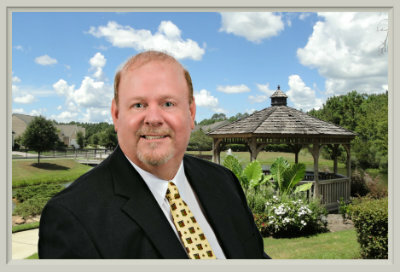 Steve looks forward to hearing from you and assisting you with your Bluffton SC real estate and home goals. Relocating home buyers and real estate investors connect with Steve for the personal realty service they deserve from an expert real estate Buyer’s Agent and an Accredited Buyer’s Representative (ABR®). The ABR® designation is the benchmark of excellence in home buyer representation. Steve will listen to your needs and desires in what you would like in your next Bluffton area home. He makes it his duty to find you not only a home to meet your needs, but the perfect combination of amenities, location and design to best fit who you are and exactly how you aspire to live in Bluffton, South Carolina. Relocating home sellers connect with Steve to determine their house value, find a top-notch marketing plan, list their homes for sale, and to have a skilled negotiator on their side. Our program for Bluffton SC real estate property and home sellers, is a multi-faceted approach to selling Bluffton SC real estate using the best of traditional and digital real estate marketing. 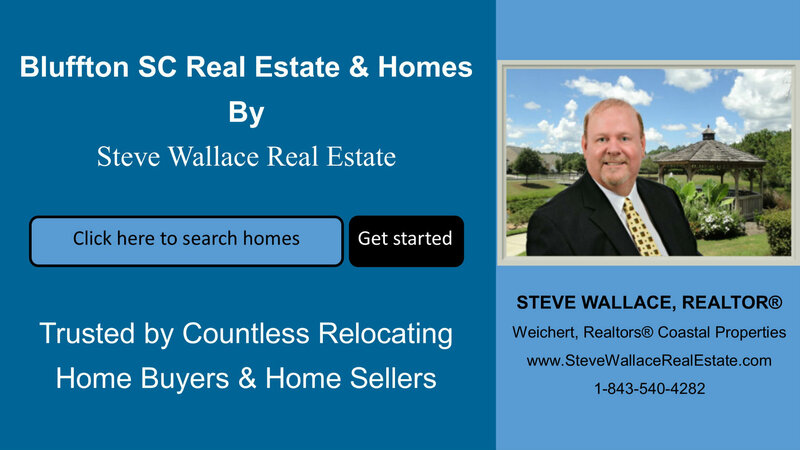 The Steve Wallace Real Estate, old school traditional, landing page is our home page and it is loaded with easy to access real estate listings, pre-formatted home searches by neighborhood, a home sweet home music player, drop-down menus to access a wealth of information, and so much more. Don’t get us wrong, we also believe in the current popular suggestions for optimized landing pages and use them as well; but, our home page will allow you to get to know Steve Wallace Real Estate and doesn’t force you to make contact to gain local information. Bluffton – Search Bluffton SC homes for sale, condos and villas for sale, and lots/land for sale. Search homes by Bluffton Plantations and neighborhoods located Bluffton Off Plantation. Search and find golf properties, equestrian properties, homes in active adult SunCity neighborhoods of Sun City Hilton Head. Hilton Head – Search Hilton Head SC homes for sale, condos and villas for sale, and lots/land for sale. Search homes in Hilton Head Island plantations and homes Hilton Head/Off Plantation. Find magnificent beach and oceanfront properties as well as affordable villas listed for sale. Areas – Learn about our service areas including Bluffton, Hilton Head Island, Callawassie Island, Sun City Hilton Head, Beaufort, and other areas in the South Carolina Lowcountry. Resources – Find e-books on Bluffton SC real estate, information on buying homes, community links, video messages, key items for home buyers, key items for home sellers, FAQs, neighborhood descriptions, property owner association (POA) fees, title and escrow information and so much more including our popular and free guide about Relocating to the South Carolina Lowcountry areas of Bluffton, Hilton Head Island, Beaufort and areas beyond. Learn about amenities, the climate, the people, housing, arts & entertainment... and more.  About – Learn about Steve, read testimonial letters, discover home buyer and home seller services. Let’s Talk – Contact Us, request our dream home finder service and get a free market analysis on your home. Find the latest Bluffton homes for sale on the Bluffton SC real estate and homes landing page of Steve Wallace Real Estate. You’ll also find Newly Listed Homes in Hilton Head Island, SC and real estate properties. Thinking luxury? Luxury real estate is one of our specialties. Find all the new listings of Bluffton luxury homes for sale at our "New Luxury Listings" section near the bottom of our home page. As a bonus, you can click on our Bluffton SC real estate audio player to enjoy our custom "home sweet home" music. Along with the music player on the bottom of our landing page for Bluffton SC real estate and homes for sale, you’ll find links to homes for sale in our top neighborhoods. Find links to homes in Belfair, Berkeley Hall, many neighborhoods located Bluffton/Off Plantation, Callawassie Island, Colleton River, Hampton Hall, Hampton Lake, Oldfield, Palmetto Bluff, Rose Hill Plantation – Golf Side, Rose Hill Plantation – Estate Side and homes in Sun City Hilton Head areas of Sun City Common, Sun City Riverbend and Sun City North. You'll also find a great selection of homes for sale in the premier resort destination of Hilton Head Island as well as Hilton Head Condos and Villas. Last, you’ll find our easy to use chat feature and the contact information for your resident Bluffton SC real estate agent, Steve Wallace, Realtor. Click here to access the Bluffton SC Real Estate Landing Page for our seller's e-book. Click here to access the Landing Page for our Sun City Hilton Head e-book. Please bookmark the landing page for Bluffton SC real estate and homes online at https://www.stevewallacerealestate.com/home-page. Share our landing page address with friends, family, and anyone with an interest in Greater Bluffton, South Carolina real estate and homes for sale. Come back often for a wealth of information and to search homes for sale, condos/villas for sale, land for sale and foreclosures for sale. 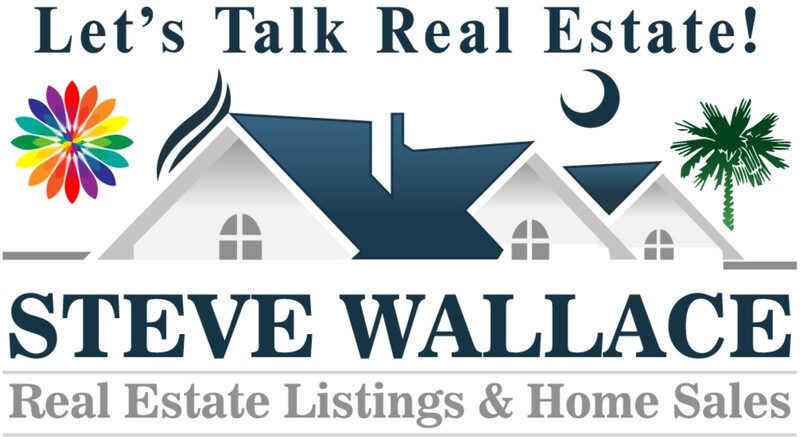 Connect with your local real estate expert, Steve Wallace, Realtor, to get your questions answered and to buy or sell homes. On your journey, to your next home, make your first move a call, to Bluffton resident Realtor® Steve Wallace.